Singapore’s founding father Lee Kuan Yew resigned his cabinet post on May 14 after his party, the People’s Action Party (PAP), garnered just over 60% of the popular vote, its weakest showing since the PAP first participated in elections in 1959. 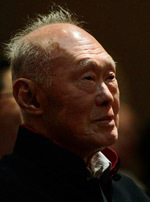 The 87-year-old Lee was Singapore’s first prime minister and served in the post from 1959 to 1990. Afterward, he served in the parliament and in 2004 took on a special advisory role in the cabinet. Fellow PAP member Goh Chok Tong, who also served as prime minister and in the cabinet, joined Lee in announcing his resignation from the cabinet. In a joint statement, the two former prime ministers said the decision to step down came “after a watershed general election.” The election was historic for more reasons than its outcome. The Singaporean government, which normally strictly controls media coverage, allowed candidates to utilize social media. Information about rallies and recordings of campaign speeches were easily accessible online, allowing opposition candidates to more widely disseminate their ideas—and their criticisms. Economic issues were also important. Singapore’s GDP grew 14.7% in 2010, making it the second-fastest-growing economy in the world behind Qatar. Many of its citizens, however, are struggling to afford housing and to compete for jobs with foreign workers. Inflation is also a problem, with the consumer price index up 5.0% year-on-year in March. In their joint statement, Lee and Goh said that “The time had come for a younger generation to carry Singapore forward.” Despite the resignations, the political power of the Lee family and the PAP will remain intact. Lee and Goh will serve out their terms in the parliament, and Lee’s son, Lee Hsien Loong, will continue to serve as prime minister, a position he took over from Goh in 2004. Also, due to structural constraints, the PAP will keep control of 81 of the 87 seats in the parliament, enough to pass a constitutional amendment.